I often have pre-conceived notions about movies. So, when I hear that a film tells an inspiring story about a real life hero, I have an idea as to what that movie is going to be like. Such is the case with STRONGER (2017), which tells the true story of Jeff Bauman, the man who lost his legs in the Boston Marathon bombing in 2013 and later became a symbol of hope for an entire city as he fought back to regain both his life and his ability to walk. I expected it to be good, but STRONGER is better than all of my pre-conceived notions about it. Why? For one thing, Jeff Bauman had no interest in being a model of hope to an entire city. He had no interest in getting his life back, mostly because he saw himself as a loser. So, when these things ultimately happen, they’re not just examples of teary-eyed sentimental storytelling. The story here is real, gripping, and incredibly fresh and honest. Jeff Bauman doesn’t just rise up and decide to become an inspirational human being. If anything, he pushes back against the notion. His is a truly heroic journey, one that takes him down into the depths of despair and darkness before he ultimately rebounds and climbs his way back to the road to humanity. Jeff Bauman (Jake Gyllenhaal) is at the finish line at the Boston Marathon to cheer on his girlfriend Erin Hurley (Tatiana Maslany) who’s running in the race that day. Jeff and Erin are in an on-again off-again romance, which lately had been off-again. The irony of Jeff’s being at the finish line that day is that he is notorious for not showing up or being where he is supposed to be, which is why Erin continually gets frustrated with him. But on this day, Jeff shows up, and he’s there at the finish line when the bombs go off. The film kicks into high gear when Jeff’s extended family arrives at the hospital. This is not a scene where there is a group of folks sitting and sobbing, while sad music plays in the background. No, the minute we see these people they are shouting and arguing and hurling accusations like it’s nobody’s business. It’s a refreshingly honest scene showing people who are scared and angry that their son has had his legs blown off by a terrorist on their home turf in Boston. In fact, this is one of the best parts of the movie, the dynamic of Jeff’s family. They are a dysfunctional group, but they always have Jeff’s back, and he swears by them, at one point saying after cussing them out that he still wouldn’t trade them for anything. They are exactly the way many families are: flawed but united. Jeff returns home to the small apartment he shares with his mother Patty (Miranda Richardson), who spends most of her time drunk or hung over. Jeff soon asks Erin to move in with him, and she does, which is a good thing because he needs her help to recover. But Jeff is struggling with everything. Everyone keeps reminding him what a big hero and inspiration he is, but he can’t see it. He still drinks way too much and slowly begins to distance himself from Erin once more. It’s not until he finally agrees to meet with the man who saved him, the man in the cowboy hat, Carlos (Carlos Sanz), that things change. Up until that moment, Jeff had only been able to see things through his own eyes, but when he hears Carlos’ story and learns the reason Carlos was there that day in the first place, and what it meant to Carlos to save him, Jeff’s eyes are opened. It’s a telling moment in the film, a reminder that all too often we only see things through our own prisms and perspectives, and we forget that others we interact with have their own issues and agendas. STRONGER has a superior screenplay by John Pollono, based on the book “Stronger” by Jeff Bauman and Bret Witter. The dialogue is first-rate, natural, cutting and incisive, and at times laugh-out loud funny. The combination of the writing and acting brings Jeff’s family to life. I’ve always been a fan of Jake Gyllenhaal, and while he has delivered a lot of memorable performances over the years, his work here as Jeff Bauman ranks as one of his best. Sure, he captures the obvious pain the man went through after losing his legs, but more so, he shows what it’s like to be a guy who didn’t really want to be in the limelight, who didn’t want to be a hero, a guy who really struggles when people cheer for him, because he feels he doesn’t deserve it, because he knows he’d rather be out drinking with his friends or at home playing video games. Tatiana Maslany is just as good as Jeff’s girlfriend Erin. She feels incredibly guilty that Jeff was there that day because of her, and she really loves Jeff and is more than willing to move in with him and help him, even with her reservations that he so often drops the ball and leaves her hanging. I really enjoyed Maslany’s performance, and she has some of the more emotional scenes in the movie. Miranda Richardson is excellent as Jeff’s mother, Patty. She makes Patty more than just a down and out drunken mother. She really cares for her son. More often than not she screws things up, but she always puts her son’s needs first. For example, soon after Erin moves in, Patty catches her leaving Jeff’s room wearing just a nightshirt, and she glares at Erin and asks her, “Did you sleep with my son?” To which Erin casually replies, “Yes.” And that’s that. No insane Norma Bates ravings. Sure, later there is a messy painful argument in front of Jeff between Erin and Patty in their car, and Patty shrieks “You’re off the team!” but later when Jeff decides he can’t live without Erin and meets with her to get her back, it’s Patty who drives him there. All the actors who play Jeff’s family members stand out. Veteran actor Clancy Brown plays Jeff’s father Big Jeff, who’s no longer with Patty. In that first scene in the hospital, it’s Big Jeff who’s aggressively arguing with nearly everyone. And longtime Boston comic and RESCUE ME (2004-11) star Lenny Clarke delivers a scene-stealing performance as Uncle Bob. He has humorous lines in nearly every scene he’s in, and he serves as that much-needed comic relief as the family scenes are often very tense. It’s a memorable performance. Danny McCarthy has some fine moments as Jeff’s former Cotsco manager Kevin, and Carlos Sanz delivers a sensitive, moving performance as Carlos, the man who saved Jeff’s life that day at the finish line, whose own story is just as emotional and inspirational. Director David Gordon Green does an excellent job here. I especially liked the way he handled the bombing scene. When the bombs first go off, there’s minimal coverage in the movie. It isn’t until much later, when Jeff looks back at the moment and remembers what happened, that we get in close and see firsthand what Jeff saw shortly after the bombs exploded. The images are not easily forgotten. There’s also an effective scene where the doctors are removing the dressings from Jeff’s legs that really give the audience the idea of just how much pain Jeff was experiencing at the time. The film is not slow, nor overbearing, nor syrupy-sweet inspirational. It’s nicely paced, funny and hard-hitting at the same time, and most importantly, brutally honest. STRONGER is one of the best movies I’ve seen this year, and I definitely recommend it. As a lifelong Boston Red Sox fan, who endured years of misery watching the team lose big games on the national stage in the most excruciating of fashions (“Bucky bleepin Dent,” Aaron “who?” Boone) I was among the ecstatic members of Red Sox Nation in 2004 and 2007 when they finally did the unthinkable and discovered the Holy Grail of Baseball, winning the World Series, not once, but twice. Heck, not only did the Sox win two World Series, they didn’t even lose a game! They swept both Series! They went 8-0! It’s never been lost on me that the guy who guided both these teams, manager Terry Francona, was a pretty special manager. In his years guiding the Red Sox, he became my favorite manager, not because he regularly displayed a Bill Belichick-like genius, but because he always got the most out of his players, constantly put them in the position to win, and in two trips to the World Series, never lost a game. His Championship record is 8-0! Not even Mr. Belichick can claim that record! And yet, after the 2011 season, Francona was fired. How do you fire a manager who owns an 8-0 record in the World Series, the very same Series that the Sox hadn’t won since 1918? It made no sense to me. Sure, the team had just endured a historic collapse in September 2011 and missed the playoffs, losing to the Baltimore Orioles on the last day of the season. And sure the Sox under Francona hadn’t won a playoff game since 2008. Still, if you’re the owner of this team, it seems to me you want the guy with the perfect World Series record leading your team. Anyway, I was excited to read Francona’s memoir of his Red Sox years from 2004-2011, Francona: The Red Sox Years ,written by Terry Francona himself and BOSTON GLOBE columnist Dan Shaughnessy. For a Red Sox fan, it’s a fascinating read. I wish video footage existed of some of the more lively situations depicted in the book, as Francona’s use of “colorful” language provides readers with an earful and had me laughing out loud frequently. Such gems as the Red Sox trip to Japan, Francona’s growing frustrations over having to deal with Manny Ramirez, and the manager’s frequent run-ins with Red Sox ownership, especially Larry Lucchino. I was struck by how rude Lucchino treated Francona during his tenure as Red Sox manager. By far this was my favorite part of the book, getting a behind the scenes look at what went on during those years, years in which I watched most of the Red Sox games recounted here. Things would happen with the team during the course of the season, and Francona would say something positive in his press conference, and I’d be at home wondering, “what’s really going on?” Well, this book makes it clear what was really going on. In doing so, it provides a lot of insight as to what it takes to be a big league manager these days. You have to have thick skin, and you have to get the best out of players who really possess more power with ownership than you do. Francona is a master at this, as he makes his players feel good about themselves, and they go out and play hard for him. It was painful to read about the 2011 collapse, and it’s interesting to note that at the same time the team was falling apart, Francona was dealing with painful personal issues, a divorce and his own physical pain from his knee surgeries from his years as a player. It makes you wonder if he would have been able to handle things better if he hadn’t been dogged by personal demons. I also enjoyed the description of Francona’s meeting with ownership after the historic collapse, a meeting in which it was clear to Francona that the owners didn’t want him back, yet no one in the room wanted to be the one responsible for firing the two-time World Series winning (and still very popular) manager. And so he wasn’t officially fired. Ownership said they didn’t want to fire Francona at that point, that they wanted him to take some time and think about his future with the team. This certainly makes sense, since after any traumatic event, it usually is a good idea to take some time away to think and reflect on things before making a decision. But Francona counters by saying no one in that room voiced any enthusiasm or support for him, and it was clear by what they said and their body language, that they no longer supported their manager. Francona: The Red Sox Years is an easy read, well suited for a summer day at the beach. Dan Shaughnessy’s style is as accessible as it is comprehensive, and the writing is topnotch. 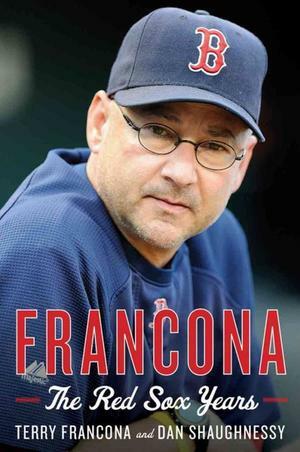 Francona remains as likeable behind the scenes as he was in front, before cameras and in the dugout, perhaps even more so, as here in the book he’s unfiltered, and his use of raw language— there are F-bombs flying everywhere— is both hilarious and refreshing. It’s more than just the story of one of the Red Sox’ most successful managers ever. It’s the story of what goes on behind closed doors when you’re manager of a major league ball club, how a manager is treated by his players and by ownership, and how it can be a very thankless job. I’ve always liked Terry Francona, and after reading this book, I like and respect what he did with the Boston Red Sox even more. Just be prepared for an earful. Who knew baseball without a filter could be so much fun?